Scratch is a tool aimed at kids to make animations, games and interactive artworks, scratch is developed by MIT media lab. With scratch anyone can create animations or games with out knowing any programing language. One can import pictures from the computer and start animating it, the program provides buttons that have programmed to do activities like move forward, backward, rotate etc. Adding sounds to the presentations and some other characters is easy, the characters colors and costumes can be changed in few mouse clicks. Overall kids will enjoy doing stuff like this. Your creations can be posted to the scratch site to share with the world and comment on others creations. The program works by making the act of creating a computer program more like building with Lego bricks. “Kids make programs by snapping blocks together,” said Professor Resnick, whose position is in part supported by the toy company. Objects and characters, chosen from a menu and created in a paint editor or simply cut and pasted off the web, are animated by snapping together different “action” blocks into stacks. 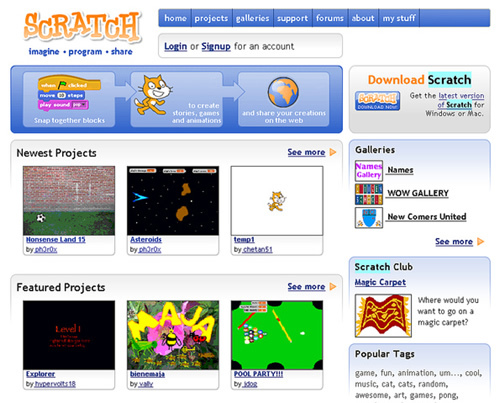 Scratch is now available to download for free and works with both Apple Macs, Windows and Linux version expected in the late 2007. Scratch site is currently down after it hit digg front page. I like this one. I’m sure my kids will get a kick out of this, thanks.